One of the best parts about summer are the delicious fruits of the season! From apricots to peaches and strawberries, there are plenty of fresh, juicy fruits available at the local markets. This also means we have the opportunity to enjoy them in a variety of recipes or fresh from the fridge. During the summer, fresh fruit is my go-to snack anytime of day. But, I am also a smoothie lover! We love finding new smoothie recipes to try. Of course, after doing Whole30, we know to limit our (natural) sugar intake with fruits, but it doesn’t mean we don’t enjoy an occasional fruit smoothie every now and then. Growing up, I remember going to my uncle’s house and heading straight for the peach tree in his front yard. That lone tree was the reason I grew to love fresh peaches. Colby, for some odd reason, didn’t even realize I loved peaches until just this past year! How that is possible after almost 27 years together I’ll never know; but it’s true. When I asked him to add peaches to the grocery list he thought they were for the kids, but, nope, they were my latest craving. Because Colby likes making smoothies, mostly so he can use his Ninja Blender, he decided to drop a peach into the mix one morning to see what kind of smoothie recipe he could come up with. Looking at the ingredients we had, he chose to keep it simple– and dairy free with almond milk. 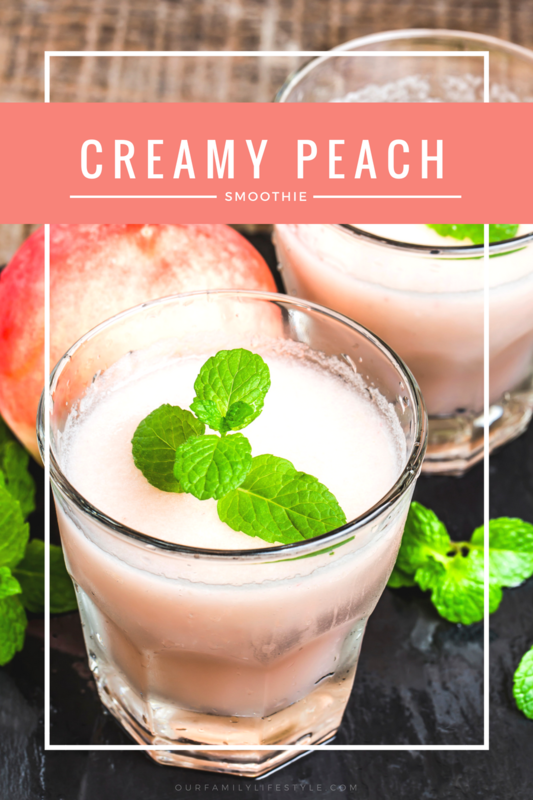 The creamy peach smoothie he threw together was extremely easy to make (only 4 ingredients) and was delicious! Plus, the thick and creamy smoothie recipe not only makes for a great breakfast drink, but is an excellent afternoon treat on a hot summer day as well. Try the peaches and cream smoothie for yourself and be sure to get creative with your own fruity flavors! Pour almond milk in an ice cube tray and freeze solid. Once frozen, pull from tray and place in blender. Add peaches and honey to blend on high speed until smooth.